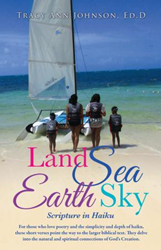 Tracy Ann Johnson’s new book, LAND SEA EARTH SKY - Scripture in Haiku, ($14.99, paperback, 9781498435222; $7.99, e-book, 9781498435239) is a devotional using a haiku poetic form. Haiku is a Japanese poetic form that originated in 9th Century Japan. It is a three line, seventeen-syllable poem that conveys deep emotion using metaphors, similes and nature. This unique devotional was written to familiarize the Christian community with this kind of poetry and to inspire literary communities and poetry lovers to investigate the Bible – to view it not only as literature but also as the true and living Word of God. This book is also a teaching tool that explains the structure and background of haiku and its derivatives. The introduction of the book prepares the reader to better understand and appreciate the poems and the scriptures that follow. The author believes her book will be of special interest to individual poetry lovers and a noteworthy contribution to Christian institutions, haiku communities and other poetry, language arts, and educational organizations. Tracy Ann Johnson, Ed.D, is a native of the Washington, D.C. Metropolitan Area. Although born and raised in D.C., she has lived in Prince George’s County, Maryland for over 35 years. She is a born-again Christian, wife, mother and grandmother. Having retired from Prince George’s County Public Schools, Dr. Johnson continues teaching as an adjunct professor at Prince George’s Community College. In past years, she has performed her poetry in local churches, schools, and libraries and has published some of her poems on-line and in church and college literary magazines. For a long time, she has promised herself and God that she would publish at least one book of poetry. She has written many poems over the years and has enough to fill at least two volumes. However, for this book, Land Sea Earth Sky, the Lord inspired her to write all new poems in the haiku genre - putting “new wine in new bottles”. Xulon Press, a division of Salem Media Group, is the world’s largest Christian self-publisher, with more than 15,000 titles published to date. Retailers may order LAND SEA EARTH SKY - Scripture in Haiku through Ingram Book Company and/or Spring Arbor Book Distributors. The book is available online through xulonpress.com/bookstore, amazon.com, and barnesandnoble.com.